No code changes, just testing a Release Candidate prior to releasing. Please, let us know if you encounter any new issues (refer to the bottom section of this thread for Known Issues). 3) Tested OK on Fast Ring x64 18312 / FR x86 18309 (newer versions than the ones listed here will most likely  not work). 2) Addressed SBIE2209 Cannot translate SID to user name: [22 / 1332] message that would trigger when using a Sandbox restricted to specific users only. As a workaround, please remove 1 character from your Sandbox's name (31 characters should work as expected). Google Chrome will not install inside the Sandbox. This is still under investigation, no workaround as of now. When upgrading to Windows 10 Insider - Fast Ring- 17755.1 or higher - Including Release Windows 10 1809 Oct Update -, you may be presented with a message stating Sandboxie needs to be deleted (If using any version other than Sandboxie 5.27.1). Please, delete the old Sandboxie version and its installers before proceeding with the upgrade, then reinstall Sandboxie normally (or upgrade to beta 5.27.1 prior to running the Windows update). Unable to install programs or launch Sandboxie installed programs: viewtopic.php?f=11&t=26160 ---> FIXED in beta 5.27.2 - However, MSI installations / installations that require services will still fail . I just want to report that 5.27.1 is working well in my W7 and W10 computers. All programs I run, are running well under Sandboxie. Sandbox --> Create New Sandbox --> Give it a name. Ensure the bottom section for copying settings reads "none" . SBIE works even on new insider feed, but google chrome installer does not work at all. Just starts and closes without any messages. I've made the devs aware. So I had Windows 10 1803 installed and wanted to upgrade to 1809 Redstone 5. It said Sandboxie 5.26 were not compatible. Okay, I've uninstalled sandboxie, then upgraded to 1809, then installed Sandboxie Beta 5.27. Then I've tried launching a sandboxed app which I had installed in one of my sandboxes. It crashed. Okay I thought perhaps there are some registry stuff or files that are messy since Windows upgrade. So I created a new sandbox based off the sandbox settings. I tried to install the program in the newly created sandboxed. Installer crashed. Okay I thought perhaps its one of the sandbox settings for whatever reasons. So I created a new sandbox based on DEFAULT settings (i.e. none of my sandbox settings) and tried to launch the installer there, it crashed. Then I've tried all other existing sandboxes, installer crashed. No idea if thats because of Windows 1809 or because of Sandboxie 5.27 but now I'm unable to launch most sandboxed apps or install most things sandboxed. Just a clean install of octuber iso on Virtualbox: The system can not find the path specified. Sandboxie 5.29.2 - Windows 10 1809 x64 - Windows Defender only. We cannot test and assist you without it. We will update this response, as well as the thread as soon as new info becomes available. I am still in the process of getting the latest update. Does any one else see any 4625 errors ? Is it at the application level log? What's the full message please? A fresh installation of windows 10 october iso 64 bits on latest VirtualBox. I didn´t touch or configure anything else on W10, it was only a testing installation before installing it on my host system. I wanted to make sure I would not have problems using Sandboxie on october edition. 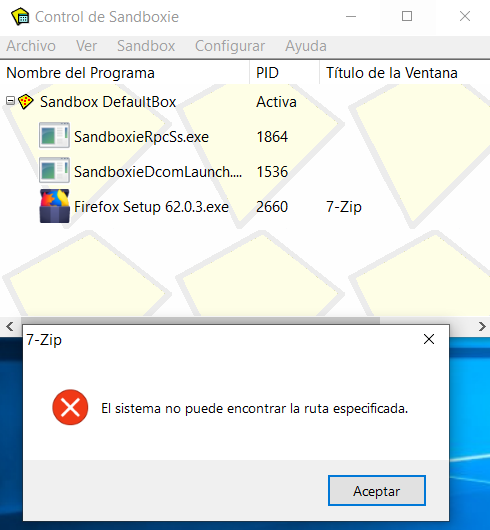 The first i did was install sandboxie beta and then tried to install the latest version of Firefox on the default sandbox and that error happened.